Pets are great. They provide us with entertainment, companionship, and unconditional love. They also stink. There is no getting around it; no matter how much you love your pet, there is a good chance they are leaving odors in your carpet. They might be rolling in something juicy in the backyard and then having a good rub on the carpet when they come back inside. Or they might be tracking in unknown substances on their paws. Or maybe they haven’t quite got the hang of the whole “going potty outside” thing yet. Whatever the reason, there are a lot of ways that your pets are making your carpets smell less than their best. Here are some tips from our Casper carpet cleaning team to help you eliminate all of those odors and prevent them from happening in the first place! Yep, the same stuff that you use to wash dishes in the sink is also great for getting out pet odors. Just put a few drops of it on your carpet and blot it with a damp, clean cloth. Make sure you rinse it with cool, clean water afterward to prevent tracking. If you can smell your carpets before you even get inside the door, break out the baking soda. Sprinkle a layer over your carpets and let it sit there for a couple hours. If the smells are really stubborn, you can use a soft-bristled brush to work the baking soda into the fibers. Then just vacuum it all up and the odors should disappear! This should work for most of your upholstered items, too. Vinegar is great for all different types of cleaning work in your home with the added benefit of being non-toxic (something that’s even more important when you have pets and children). Mix vinegar with baking soda and put it in a spray bottle. Simply spray it onto your carpets and blot them dry. If you decide that store-bought cleaners are necessary, look for ones with enzymes. These are especially useful for indoor potty accidents. They will eat the offending material and leave your carpets smelling great. Cleaners without enzymes are probably just masking the smell, and it will come back when the fragrance wears off. This is another great all-purpose cleaning solution for your home that’s especially good for potty accidents. Spray the hydrogen peroxide onto the stain and then sprinkle it with baking soda. Blot up the liquid and vacuum the area once it’s dry. You’ll want to be sure to test the hydrogen peroxide in a corner of your carpet first to make sure it doesn’t change the color of your carpets. A good vacuum can make a big difference when it comes to keeping your carpets odor free. Look for vacuums that have a quality HEPA filtration system on them. This will help pull the odors out of your carpet and trap them. Make sure you vacuum regularly to eliminate smells from pet hair and tracked-in debris. It will help with your allergies, too. 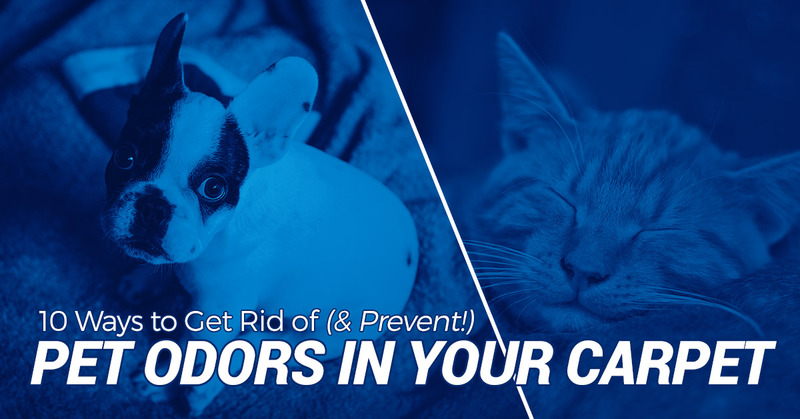 The faster you act to eliminate pet odors, the less time they’ll have to soak into the fibers of your carpet and become a permanent fixture of your space. If you notice an accident or see your pet tracking in something nasty, take care of the problem right away with one of the cleaners listed above. Brushing your pets often can help get rid of any pet hair, dandruff, or debris that might get tracked into your carpets and cause them to start to smell. Brush your pets outside or in an area that’s easy to wipe down (definitely not on your carpets). If you have indoor/outdoor pets, make sure that you wipe their paws after they’ve been outside. This will keep them from tracking in anything nasty on their paws. You’ll notice a huge difference in how often you have to sweep your floors when you do this, too. At the very least, put out welcome mats at all of your outside entrances so pets have to cross them before they come inside. If you are a pet owner, you need to have your carpets cleaned twice a year. This will help keep your carpets fresh, free from allergens and odors. Even if you don’t think your carpets smell, there is a good chance they do and you’ve become nose-blind to the smell of your own pets. Others notice when they come into your home. But if you get your carpets cleaned regularly, you can rest easy knowing your carpets are clean and free from smells. 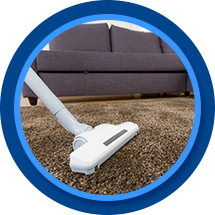 Professional carpet cleaning is really the only way to be sure that all the odors from your carpets are gone for good and haven’t just been temporarily masked by fragrances. Professional carpet cleaning offers a deep-down clean that can’t be matched by other methods. Are you a pet owner in the Casper area who is concerned about odors in your carpeting? Get in touch with us. Our carpet cleaning team in Casper can give you a free quote on your carpet cleaning needs. We’re pet lovers, too, and we’ll make sure that we use products that are safe for you and your pets as we work to eliminate stains and smells from your home. Give us a call or contact us through our website today!